As Black Friday came to a close, Irish retailers were upbeat about its impact on sales but huge crowds failed to materialise in town centres as many people chose to avoid traffic jams and bad weather by shopping online from their homes or offices. Large shopping centres fared better, reporting brisk business as consumers went in search of bargains without having to venture out in the rain. A spokeswoman for Arnotts department store in Dublin expressed satisfaction with how its “Mega Event” was going but said sales at its online arm had “far exceeded expectations”. Argos said its online business had seen a 47 per cent increase in traffic over the course of yesterday. A spokeswoman said its busiest hour online was between 11am and midday with 30,000 visits recorded in 60 minutes. Littlewoods also reported brisk business online and while eBay.ie was unable to separate its Irish and British shoppers, a spokeswoman said about nine million people from these islands visited its website yesterday. While some shops in Dublin city centre seemed slightly busier than normal, it was business as usual for most of them. 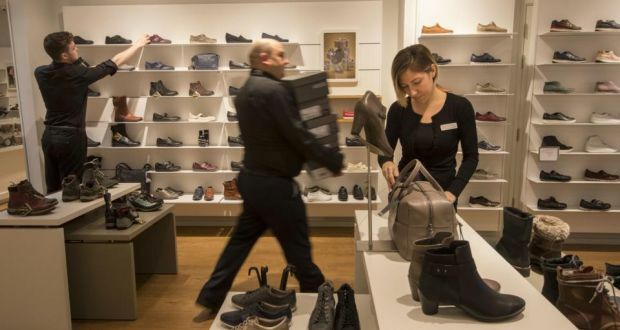 Ecco Shoes on Grafton Street was first out of the Black Friday traps, opening its doors at 6am with discounts of 40 per cent. It reported very busy early trade. The shopper no-show was more pronounced in the UK, where some stores opened their doors at midnight to find only journalists outside waiting to record the chaos that never came. The scenes from last year of bargain-hunters coming to blows over cut-price televisions were not repeated. Police erected security barriers around some key shopping areas but they were not needed.